From the number-one New York Times best-selling author of Grace's Guide and the host of The Grace Helbig Show on E! 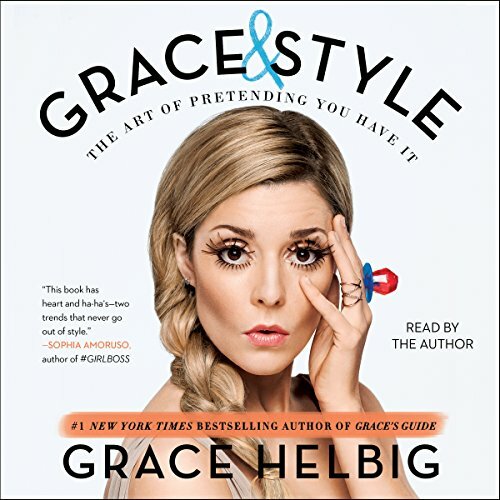 comes a tongue-in-cheek book about style that lampoons fashion and beauty guides while offering practical advice in Grace Helbig's trademark sweet and irreverent voice. It's clear to see I'm a style icon; remember, you can't spell icon without "con". Grace Helbig doesn't want to tell anyone how they should dress, how they should do their hair or makeup, or even which dog poop bags to purchase - because surprisingly, Target has numerous options for that too! While Grace doesn't claim to be stylish or polished, she is very self-aware and perceptive. Trendy? She'd rather have fun trying. She loves fashion as much as the next lady, man, or French bulldog, but telling others how they should look doesn't suit her. Instead, with Grace & Style, Grace takes us into her closet and shares her silly and practical approach to style - which obviously includes an entire chapter on sweatpants. ©2016 Grace Helbig (P)2016 Simon & Schuster, Inc. There were a few gems, but not very relatable overall. Grace did a great job delivering the reading. I didn't enjoy the "sweatpants diaries" or the thousands of puns, but I expected more real stories. It may be better as a book. Totally a waste of my time. I was hoping for actual usable tips w/witty humorous twist intermingled. What I heard was ridiculous effort to try and be funny. The lists are over & above things that a child's imagination could conjure up. For example: in what not to wear to work, the list included elaborated examples of why you shouldn't wear water, wall paper, plants, etc... After a while, it's just not funny anymore. I enjoyed listening to this audiobook. However, it did skip at part of the book (pages 146 to 151 or chapter 26 of the audiobook). Only half of "My Jewelry MVP" was in the audiobook. That was kinda disappointing. Other than that, I thought the book was funny. Would you try another book from Grace Helbig and/or Grace Helbig? I love Grace Helbig with a passion, I love her on all levels of her media empire and was ready to love this book as much as the last one. Sadly this didn't go over to the audiobook feature. Not this isn't saying her performance reading wasn't good, it was the only thing that saved the book. The book isn't really meant for audible...buy the book. Has Grace & Style turned you off from other books in this genre? I'm not turned off to Grace or other books in the genre, I'll just preview and not pre-order. Which character – as performed by Grace Helbig – was your favorite? dissappointment, it didn't translate into audiobook. This book was a stupid joke. There wasn't any real or serious content. She talked about what not to wear to work like a fajita or chainmail or toilet paper. so dumb. I have nothing but positive things to say about this! So I'm gonna go say them to people IRL who haven't yet figured out how to navigate here...as you already have. Great follow-up to Grace's Guide! I bought this as an audible book. The narrative tone tries too hard to lighten a serious topic and is mostly narcissistic and annoying. The title is deceiving, there are no tips on grace or style but is a tongue in cheek stab at the fashion and beauty industry. Not really what I expected.